Sportivate is a Lottery funded London 2012 legacy project that gives more young people the chance to discover a sport that they love. The programme gives young people who are not particularly sporty access to six-to-eight weeks of free or subsidised coaching in a range of sports. If you are looking to run a Sportivate project before March 2017, we will accept interim applications for projects working with inactive young people in one of the following groups: 19 to 25 year olds or females only (aged 11 to 25). Link4Life is co-ordinating delivery of Sportivate in the Rochdale Borough. To find out more or if you think your club, group or organisation can help get more 11 to 25 year olds active in Rochdale Borough, download the Sportivate guidance and application form. Sport England have published new research about young peoples attitudes to sport and how to engage with those who are less active. There is some information in the Application Guidance (see section 3) as well as a guide from Sports Coach UK on how to make your sessions unmissable (see download). We highly recommend reading this information and trying to use some of the ideas to support your sessions. Projects that show they have taken this into account will be given higher priority at assessment. You can also track #GMSportivate to see our latest activities and events on Twitter. Doorstep Sport Clubs are fun, informal sports clubs that operate at the right time, for the right price, in the right place and in the right style. A Doorstep Sport Club provides a vibrant and varied sporting offer to young people in disadvantaged communities that is designed to grow their motivation and ability to adopt a sporting habit for life. 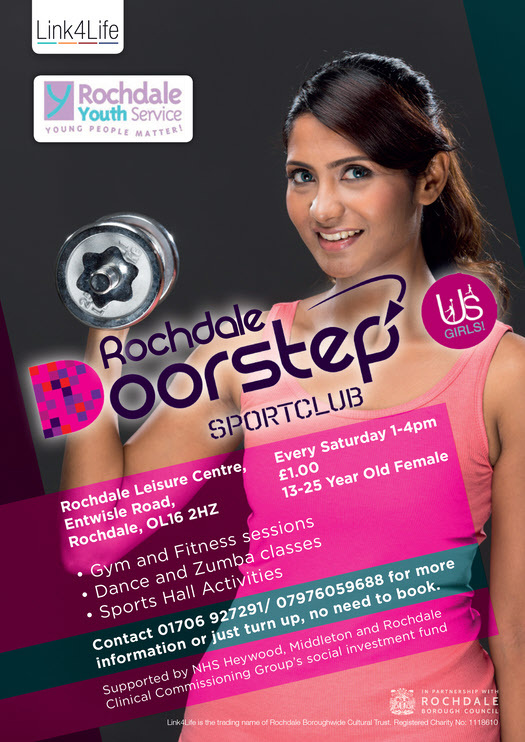 Rochdale Friday Fusion Doorstep Sport Club regularly attracts over 80 young people aged 11-19 every Friday Night 6.30-9.30pm. The session is a multi-sport and gym session run by Rochdale Youth Service and Link4Life staff. Venue: Rochdale Leisure Centre, Entwistle Road, Rochdale, OL16 2HZ. Contact: Mohammed Zarafat 07527 385749. The Saturday Women and Girls session is delivered by Rochdale Youth Service staff, Link4Life Leisure staff and local fitness and dance instructors. Females aged 11-19 can access the gym, sports hall activities, and dance and fitness activities for £1 between 1-4pm. This project is also supported through the NHS Heywood, Middleton and Rochdale Clinical Commissioning Group’s social investment fund. Contact: Amanda Mullen 07515 457361. Heywood FNP Doorstep Sport Club regularly attracts over 80 Young people aged 11-19 every Friday 6-9pm. The session is delivered by Rochdale Youth Service Staff, Link4Life Leisure and community coaching staff and local sport club coaches. There is a mix of female and males that attend participating in activities such as Football, Basketball, Fitness and Table Tennis. Venue: Heywood Sports Village, West Starkey Street, Heywood, OL10 4TW. Kingsway FNP Doorstep Sport Club regularly attracts over 60 Young people aged 11-19 every Friday 6-9pm. The session is delivered by Rochdale Youth Service Staff, Link4Life Leisure and community coaching staff and local sport club coaches. There is a mix of female and males that attend participating in activities such as Football, Basketball, Fitness and Table Tennis. Venue: Kingsway Park Sport Centre, Turf Hill Road, Rochdale, OL16 4XA. Come and train alongside Megan Greenwood to improve your fitness levels and improve your goals. A key success factor for all our Doorstep Sport Clubs has been the partnership work with Rochdale Youth service, Rochdale Borough Council and Rochdale Connections Trust who provide staff at sessions who are professionals in working with young people with different needs and problems and also recruit and refer young people into sessions. There are opportunities for us to work with other organisations working with disadvantaged or inactive groups of young people living in the borough.